St. Patrick’s day has always been a big deal around our house. My God-mother, who died of cancer when I was 5, was born on St. Patrick’s day, so as a way of honoring and remembering her, we always dressed up and ate all sorts of green food, even though we aren’t even the tiniest bit Irish. Also, my father’s name is Patrick, and he is a great man. So, this year being the first year that I had a baby to dress up for St. Patrick’s day, I put together this very simple little project so that when we head out to the parade on Saturday we are looking very festive! Step 1: Cut out the shape of a tie, and two clovers out of green felt scraps. Measure against your baby to get the right length of the tie and make sure that the clover will fit inside the bottom of the tie. Step 2: Whip Stitch on a clover to the tie shape. Step 3: Head to your sewing machine and stitch the tie shape to a onesie, simply stitching around the outside. I also stitched back and forth at the top to make it look like a knot. 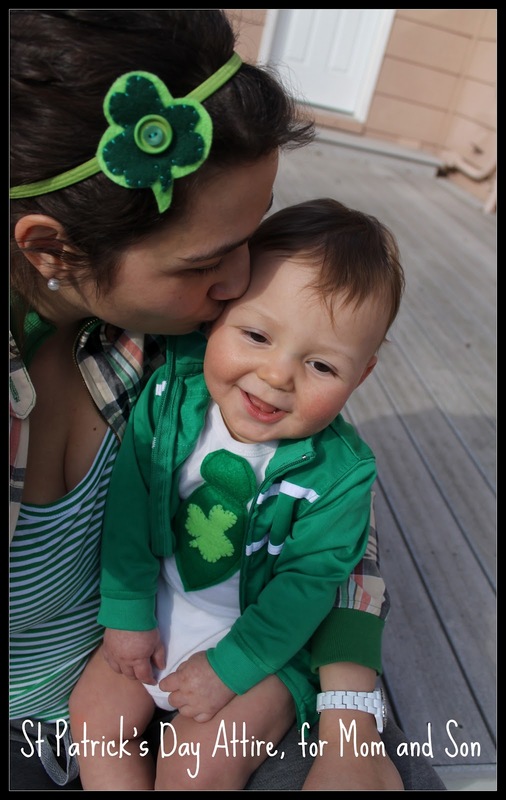 And finally, put the St. Patrick’s day onesie on a smiley little guy! Step 1: Take the remaining clover and place it on a larger piece of green felt (in a different shade). Cut around the outside. Step 2: Whip stitch the top clover down to the bigger clover beneath. I decided to add two green buttons for embellishment. Step 3: Stitch to a green elastic headband. Done! I hope you all have a wonderful St. Patrick’s day. Please, if you have any other tips, especially about food for St. Patrick’s day, please share them!